The Sampling Officials (Dutch: De Staalmeesters), also called Syndics of the Drapers’ Guild, is a 1662 oil painting by Rembrandt. It is currently owned by the Rijksmuseum in Amsterdam. It has been described as his "last great collective portrait". The men (with the exception of Bel who is an attendant as indicated by his calotte) are drapers who were elected to assess the quality of cloth that weavers offered for sale to members of their guild. Their one-year terms in office began on Good Friday and they were expected to conduct their inspections thrice weekly. The Dutch word staal means 'sample' and refers to the samples of cloth that were assessed. The inspectors used pliers to press the seals of their city (front) and guild (reverse) into penny-sized slugs of lead that were specially affixed to record the results of the inspection. 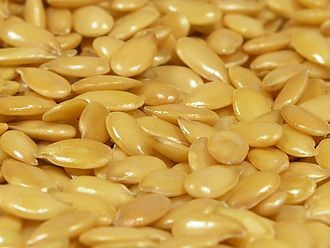 There were four grades of quality, the highest was indicated by pressing four seals and the lowest by pressing only one. The guild commissioned this portrait and it hung in their guildhall, the Staalhof (nl), until 1771. The painting is used on the packaging of Dutch Masters cigars. The painting is also seen on the wall in H.G. Wells house in the opening sequence of The Time Machine. ^ The Sampling Officials. Rijksmuseum Amsterdam. Retrieved on 2008-05-03. ^ The Worldwide Art Gallery. 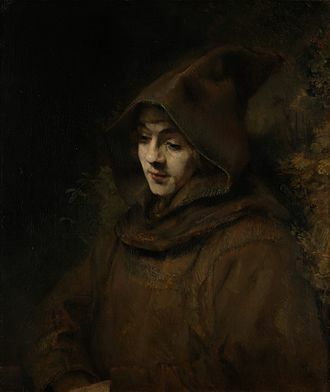 "Rembrandt Harmenszoon van Rijn (1606 - 1669)". Theartgallery.com.au. Retrieved 2014-04-08. Wikimedia Commons has media related to The Sampling Officials. Wolfgang Kosack "A second Rembrandt"
The dozens of self-portraits by Rembrandt were an important part of his oeuvre. This was a high number for any artist up to that point. By comparison, the highly prolific Rubens only produced seven self-portrait paintings, the self-portraits create a visual diary of the artist over a span of forty years. They were produced throughout his career at a steady pace. However, there is a gap in paintings between 1645 and 1652, the last three etchings date to 1648, c. 1651, and 1658, whereas he was painting portraits in 1669. 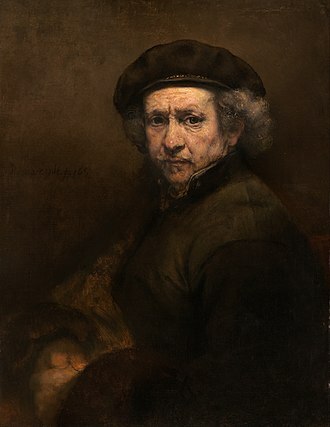 At one time about ninety paintings were counted as Rembrandt self-portraits, in others he is pulling faces at himself. Together they give a clear picture of the man, his appearance and his psychological make-up. Both seem to have often been bought by collectors, and while some of the etchings are very rare, no self-portraits were listed in the famous 1656 inventory, and only a handful of the paintings remained in the family after his death. Rembrandts self-portraits were created by the artist looking at himself in a mirror, in the etchings the printing process creates a reversed image, and the prints therefore show Rembrandt in the same orientation as he appeared to contemporaries. This is one reason why the hands are usually omitted or just cursorily described in the paintings, one may have been bought about 1652 and sold in 1656 when he went bankrupt. In 1658 he asked his son Titus to arrange delivery of another one and these are B7, B19, B21 and B22, stretching between 1631 and 1648. 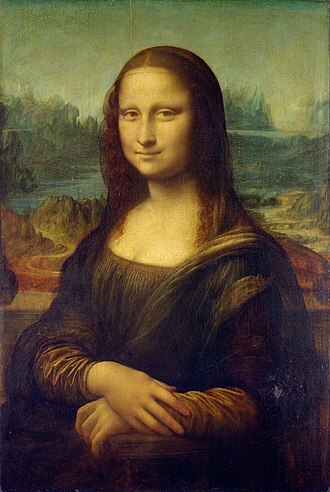 There are a number of what seem to be abandoned attempts at such portraits around the same times, while the earliest etchings are very rare, many others that are not official portraits survive in large numbers, and certainly reached the market of collectors. As noted above, there are only two sketchy etchings after 1648, and there are no etched equivalents of the great painted self-portraits of the 1550s and 1560s. The number of drawings now accepted is far smaller, in single figures, the standing portrait, if indeed by it is Rembrandt, may have been done for someone elses friendship album, keeping these was common in artistic and literary circles. The Washington red chalk drawing, perhaps the most finished example, is close to the etching B2 in many ways, since these were exclusive to aristocratic circles, it was probably invented like a piece of costume. Dutch Masters is a brand of natural wrapped cigars sold in the United States since 1912. Its distinctive packaging features Rembrandts 1662 painting The Syndics of the Drapers Guild, Dutch Masters cigars are currently manufactured and sold by Altadis U. S. A. Inc. which is the American subsidiary of French/Spanish-based Altadis S. A. in Fort Lauderdale, Florida. They come in two varieties, full size cigars, and smaller cigarillos colloquially known as mini-dutches. Johnson Cigar Company was the producer of the Dutch Masters cigar brand. Dutch Masters would become a mainstay of the Consolidated Cigar Corporation, johnson Cigar Company and six others together in 1921. The Consolidated Cigar Corp. became part of Altadis, formed in 1999 by a merger of the French, through its long history the Dutch Masters cigar brand has become one of the most popular and profitable cigar brands in America. Dutch Masters became well known in the late 1950s and early 1960s for its sponsorship of various projects of the comedian Ernie Kovacs. A guild /ɡɪld/ is an association of artisans or merchants who control the practice of their craft in a particular town. The earliest types of guild were formed as confraternities of tradesmen and they were organized in a manner something between a professional association, trade union, a cartel, and a secret society. A lasting legacy of traditional guilds are the guildhalls constructed and used as meeting places, an important result of the guild framework was the emergence of universities at Bologna and Paris, they originated as guilds of students as at Bologna, or of masters as at Paris. Usually the founders were free independent master craftsmen who hired apprentices, there were several types of guilds, including the two main categories of merchant guilds and craft guilds but the frith guild and religious guild. 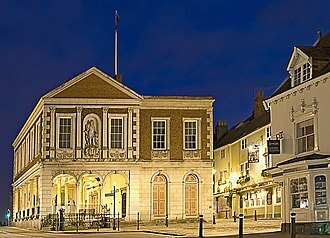 In many cases became the governing body of a town. The Freedom of the City, effective from the Middle Ages until 1835, gave the right to trade, Trade guilds arose in the 14th century as craftsmen united to protect their common interest. The occasion for these oaths were drunken banquets held on December 26, gregory of Tours tells a miraculous tale of a builder whose art and techniques suddenly left him, but were restored by an apparition of the Virgin Mary in a dream. Michel Rouche remarks that the story speaks for the importance of practically transmitted journeymanship, in France, guilds were called corps de métiers. According to Viktor Ivanovich Rutenburg, Within the guild itself there was little division of labour. Thus, according to Étienne Boileaus Book of Handicrafts, by the century there were no less than 100 guilds in Paris. In Catalan towns, specially at Barcelona, guilds or gremis were a basic agent in the society, a shoemakers guild is recorded in 1208. In England, specifically in the City of London Corporation, more than 110 guilds, referred to as companies, survive today. Other groups, such as the Worshipful Company of Tax Advisers, have been formed far more recently, membership in a livery company is expected for individuals participating in the governance of The City, as the Lord Mayor and the Remembrancer. Rembrandt Harmenszoon van Rijn’s The Abduction of Europa is one of his rare mythological subject paintings. The piece is oil on canvas and now located in the J. Paul Getty Museum, the inspiration for the painting is Ovid’s Metamorphoses, part of which tells the tale of Zeus’s seduction and capture of Europa. 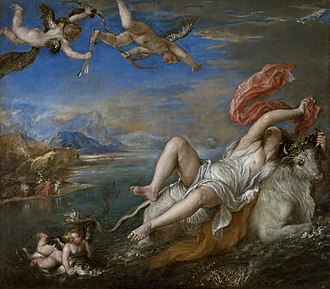 The painting shows a scene with Europa being carried away in rough waters by a bull while her friends remain on shore with expressions of horror. Rembrandt combined his knowledge of literature with the interests of the patron in order to create this allegorical work. The use of an ancient myth to impart a contemporary thought, the Abduction of Europa is Rembrandt’s reinterpretation of the story, placed in a more contemporary setting. He developed an interest in the world early in his life while in Amsterdam. Rembrandt moved to Amsterdam in 1631 because the city was a growing business-oriented center where Rembrandt found work with great success, during this time, the international High Baroque style was popular. 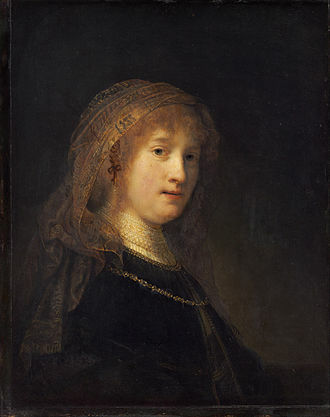 Rembrandt did not complete many mythological subject paintings, out of three hundred sixty completed works, five displayed tales from the Metamorphoses, five depicted goddesses, a Carthaginian queen, all of which only five represented myth subjects. Rembrandt occasionally used these mythological paintings as allegory, applying the tale to some Christian theme or a moral tradition, jacques Specx, of the Dutch East India Company, commissioned Rembrandt to complete The Abduction of Europa. Specx had established a center in Japan in 1609, served as the Governor of Batavia. 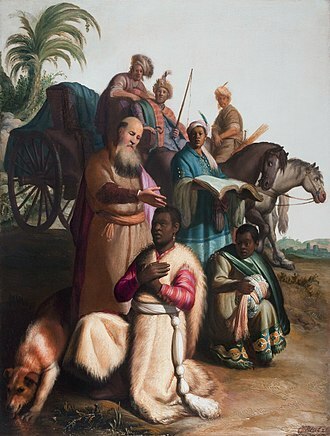 The painting certainly was in Specx’s possession, along with five other portrait pieces, the subject and its allegorical meaning can be attributed to the patron, the artist, and a Belgian art biographer, Karel van Mander, whose theories entertained Rembdrant. Van Mander’s book Het schilder-boeck released an edition in 1618. The book was produced in Amsterdam and included details about many Netherlands painters, Rembrandt surely would have read this book, both because of its importance and its location, and familiarized himself with van Mander’s theories and interpretations of Ovid’s myths. Good Friday is a Christian holiday commemorating the crucifixion of Jesus Christ and his death at Calvary. It is observed during Holy Week as part of the Paschal Triduum on the Friday preceding Easter Sunday and it is known as Holy Friday, Great Friday, Black Friday, or Easter Friday, though the last term properly refers to the Friday in Easter week. The date of the holiday on the Gregorian calendar varies from one year to the next and it is a widely instituted legal holiday in many national governments around the world, including in most Western countries as well as in 12 U. S. states. Some countries, such as Germany, have laws prohibiting certain acts, such as dancing and horse racing, the etymology of the term good in the context of Good Friday is contested. Some sources claim good to mean pious or holy, while others contend that it is a corruption of God Friday. In German-speaking countries, Good Friday is generally referred to as Karfreitag, the Kar prefix is an ancestor of the English word care in the sense of cares and woes, it meant mourning. The day is known as Stiller Freitag and Hoher Freitag. According to the accounts in the Gospels, the Temple Guards, guided by Jesus disciple Judas Iscariot, Judas received money for betraying Jesus and told the guards that whomever he kisses is the one they are to arrest. Following his arrest, Jesus was taken to the house of Annas, there he was interrogated with little result and sent bound to Caiaphas the high priest where the Sanhedrin had assembled. Conflicting testimony against Jesus was brought forth by many witnesses, to which Jesus answered nothing. Finally the high priest adjured Jesus to respond under solemn oath, saying I adjure you, by the Living God, to us, are you the Anointed One. Jesus testified ambiguously, You have said it, and in time you see the Son of Man seated at the right hand of the Almighty. The high priest condemned Jesus for blasphemy, and the Sanhedrin concurred with a sentence of death, waiting in the courtyard, denied Jesus three times to bystanders while the interrogations were proceeding just as Jesus had predicted. One of Poland's largest canvas paintings, the Battle of Grunwald by Jan Matejko (426 cm × 987 cm (168 in × 389 in)), displayed in the National Museum in Warsaw. A satin weave, common for silk, each warp thread floats over 16 weft threads. Guildhall, London, in the City of London, is the seat of the Corporation of London, the governing body of the city. There are at least three self-portraits found in the painting.